For a little while now, Aidan has been watching Will Wheaton play boardgames on Youtube, which he claims is much more amusing than it sounds. An interstate friend of ours, Terry, has also been watching. The show has inspired us each to buy certain games that Will Wheaton demonstrates, and now between us all we have an accumulation of awesome games, but very few people to play with. So this weekend, Terry came down from Sydney, and our friend Andrew came over too, and we had a boardgame extravaganza! Four people make for a much better gaming experience than two, and I believe much fun was had by all. 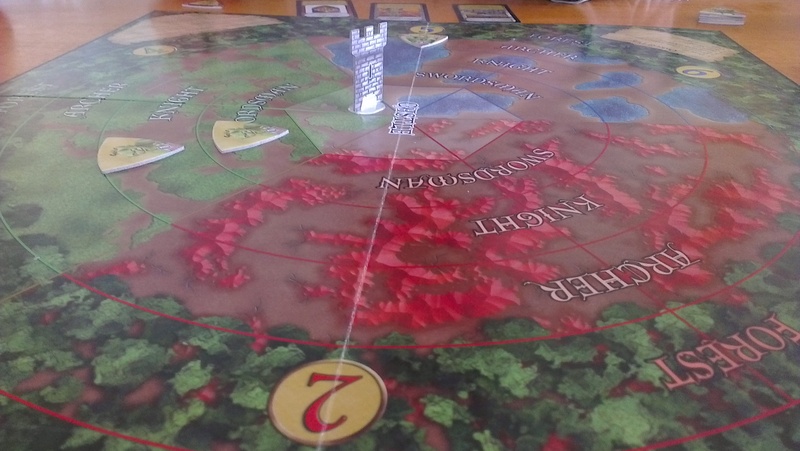 We played Castle Panic, Discworld Ankh Morpork, Ticket to Ride, Trivial Pursuit, and Munchkin. I couldn’t tell you who won and who lost; I play for the entertainment, not for the competition. But I’m pretty sure I didn’t lose everything, so that’s fine! Hopefully we’ll be able to do it again soon, and maybe even send the kids off somewhere – or get a babysitter in – to minimise distractions and interruptions. Although honestly, they weren’t too bad. More games, please! This entry was posted in Tidbits & Musings and tagged ankh morpork, board games, boardgames, castle panic, discworld, discworld ankh morpork, fun, games, geek, geeky, munchkin, ticket to ride, trivial pursuit, will wheaton. Trivial Pursuit: Pretty sure that was you. Game nights are awesome. Have fun! Lots of fun, indeed! The kids were very well behaved. I didn’t win Discworld – I can’t remember who did. Deal me in again.